Geraniums (Pelargonium spp.) include any of over 250 different species of succulent, evergreen shrubby plants native to southern Africa. According to the "A-Z Encyclopedia of Garden Plants," only 20 species are commonly used to create the many varieties planted in gardens. They need ample sunlight, low humidity and a soil with good drainage to survive; prolonged subfreezing temperatures fully kill plants. They survive outdoors year-round only in U.S. Department of Agriculture hardiness zones 9 and warmer. According to Protabase, geraniums grow well in the temperature range of 65 to 95 degrees F during the growing season, and in the winter low temperatures between 40 to 50 degrees F, according to the "A-Z Encyclopedia of Garden Plants." Protabase mentions that temperatures as low as 40 degrees F can cause initial stages of cold stress, such as reddening of leaves that normally are green and producing food. This is especially apparent on lowermost leaves on the plant, according to Ansbrook Zonal Pelargoniums Nursery. 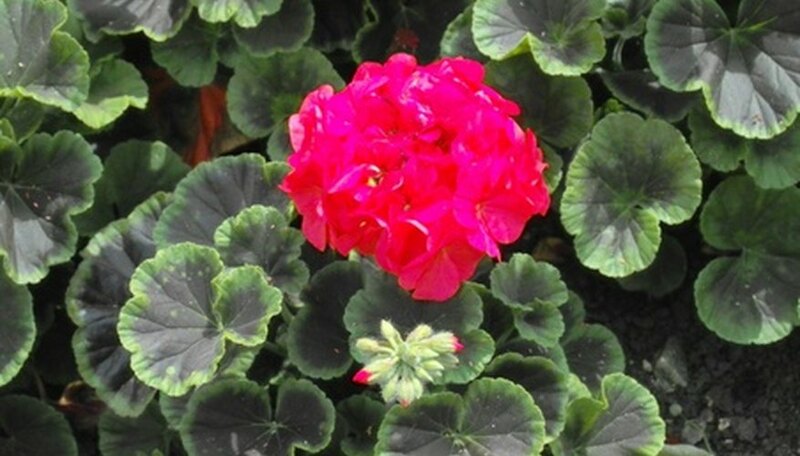 Geraniums cease producing flowers when temperatures fail to get above 45 to 55 degrees F.
In order to remain perennially evergreen, staying alive with all leaves and stems, geranium plants cannot be exposed to frosts. Frost on foliage will kill them and cause leaf drop. If frost penetrates into the tissues on the stem, it also will be killed back. From a gardener's perspective, repeated frosts or a prolonged exposure to subfreezing temperatures is not detrimental unless the cold freezes the fleshy underground roots and the crown of the plant right at the soil's surface. Expect extensive damage or plant death when air temperatures drop and remain below 25 to 28 degrees F.
If weather conditions rebound after a frost or freeze in the garden, the geranium will retain any unharmed leaves and stems. Depending on temperature, it may resume growth from its stem tip or remain dormant until suitable warmth returns in spring. Frost-killed leaves and stems become blackened and dry, although some rotting of fleshy stem tissue can occur in the area where killed tissues and living wet tissue meets. Ansbrook Zonal Pelargonium Nursery recommends only watering plants in the morning so that any water droplets have evaporated well before the night in the coolest months. Droplets can exacerbate cold damage on geranium leaves. It is especially important to have low humidity and drier soil conditions in the winter months as it prevents root rot, too. If frost or a freeze kills back tissues on a geranium, Farmer Fred Online suggests resisting the urge to immediately prune away killed plant parts. In fact, the dead, dried leaves and stems help insulate the lower living stems and the root crown from further exposure to cold. Consider removing stems only if they are rotting and threaten to spread and kill more living stems and leaves. Prune off dead stems later in winter or spring when there is no further expected chance of frost or subfreezing temperatures. New growth can sprout without worry of frosts; you note the extent of the cold damage as the growing season begins and leaves appear. Farmer Fred: After the Freeze: What Should You Do in the Garden?